This blog follows Dance Wire’s Founder/Director Emily Running in her adventures taking new dance classes all over Portland. Imagine yourself walking down the street, chewing gum, patting your head and rubbing your belly all at the same time, oh and why don’t we add in lifting your chest, tilting your chin up and wearing heels. This is what Flamenco feels like. The women in the class tell me that of all styles of dance they’ve taken, this is the most rewarding, but more on why later. Laura just moved this class to Lakewood Center for the Arts in Lake Oswego. It is a large beautiful building right next to the lake, with an expansive parking lot right out front that is ADA accessible. There are bathrooms and changing rooms inside as well as a number of studios. When you go in the front door, hang a left and walk to the end of the long hallway to the dance studios. 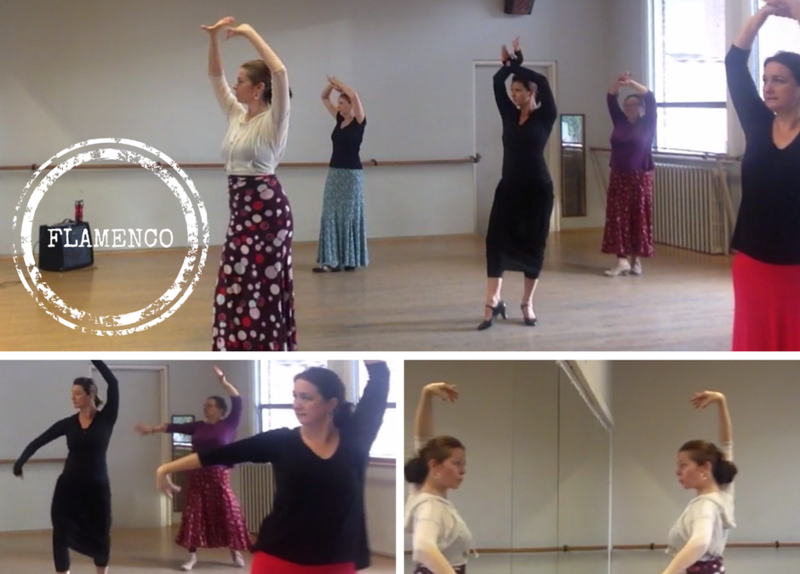 The class I went to was beginning Flamenco, as it was my first official Flamenco class ever! The warmup consisted primarily of Flamenco movements of the hands, arms, shoulders, and legs, focusing on just one body part at a time. You will appreciate this as once you start combining them all, you will need the muscle memory. As we went along Laura introduced some key terms such as gólpe, planta, tacón, and talón… which describe the action. For example with talón, the whole foot leaves the floor to strike the heel down whereas tacón may come from the planta position where the ball of the foot remains rooted in the floor and the heel drops from that position to make an audible sound. Our final dance (in the video) was the Sevillanas, a traditional folk music and dance from the Seville region. This is often done with a partner, but we learned it solo in class. After class I asked some of the women what drew them to Flamenco. They commented that it is a very strong yet elegant style and that it’s rich in culture and tradition, so much so, that one woman said even after 20 years she continuously feels inspired and like there is so much more she wants to learn. They all agreed that the immense complexity of the style is what makes it so rewarding. As with most dance styles, it looks easy if done well, but for those who challenge their body’s to do it, the dedication, focus and discipline of doing it well is what offers that sense of satisfaction and accomplishment. Check out Laura’s full class schedule including special workshops coming up this summer at the link below. Plus, don’t miss her regular Flamenco retreats to the Oregon Coast and to Spain! Find more Portland-area dance classes on Dance Wire's Find A Class Directory.